The terminal decline of representative democracy has been a theme of this blog for a couple of years. Does the 2017 General Election (GE2017) and its unfolding aftermath change this at all? On the face of it, voters have managed to give a considerable rebuff to an arrogant Governing party who had wilfully misinterpreted a supposed Brexit mandate, and to their Leader’s cynical power grab. The overwhelmingly hysterical coverage of the right wing newspapers was significantly ignored, and there is growing evidence that young people up to at least 35 years old engaged electorally to neuter the innate backward-looking little Englander sentiments of much of the old. Coming weeks will provide further evidence whether this is a major turning point, or a hiccup. Whilst hoping for the former, this blog considers work that needs to be done if we are to avoid the latter. That 40% of adults and young adults did not cast a vote should be the main story of the election. Instead the media try to applaud the rise in turnout from a fairly pitiful 66.1% in 2015 to a slightly improved 68.7%. To put this in context, all general elections from 1945 – 1997 had turnouts over 70%. The lowest of these was Blair’s landslide in 1997 with 71.4%. In 1992 33.6m votes were cast – 1.4m more than in 2017 – despite having 8m fewer residents! Similarly, and not to prick Corbyn’s bubble, in 1997 Blair’s Labour picked up 5% more votes than Corbyn with 11% less population. It is possible to find constituencies where the winning candidate got more votes than registered DNVs. In the highly contested Richmond Park, for instance, turnout was in the top handful of constituencies at over 79%. Both the winning Tory and the losing LibDem picked up 35.6% of registered voters. DNV came a distant third with 20.9%. However, this mobilisation is not the norm. Nearby, we were all thrilled with the much-recounted Kensington constituency – eventually taken by Labour’s Emma Coad by 20 votes. However, both her and her Tory opponents 26.9% of registered voters was smashed by DNVs 36.2%! Similarly Ben Bradley’s unexpected Tory cheer in Mansfield – with 30% was a distant second behind DNVs 35.5%. If we are going to stick with this rather arbitrary voting system, and as argued in my pre-election blog, it would be good to see use of big data to ensure all adults are ‘registered’ if they are on any public database at all; have voting extended to young adults; and to allow all residents (regardless of nationality) a say in their governance. With these changes, it might be fascinating to make it clear that where, despite best endeavours, DNVs beat the winning candidate – then NO MP is elected. The seat would be left vacant pending a further electoral process….eg a further set of by-elections in DNV seats, say, a month after the original vote. If residents repeatedly do not want a representative…so be it! Having interpreted turnout, a second key issue regarding the state of UK democracy concerns much-mooted ‘progressive alliance’ issues. Many have noted that, arithmetically, had an effective alliance of at least some of Labour, SNP, LibDems, Greens, Plaid been in place, not only would May have been deprived of a majority, Conservatives would probably have ceased to be the largest party as well. We shall never know. Would May have called an election at all if an effective progressive alliance had been in place? Is Labour, particularly under Corbyn, capable of building effective consensual alliances with anyone? We shall see how he fares in the current parliament, but initial portends are not good. 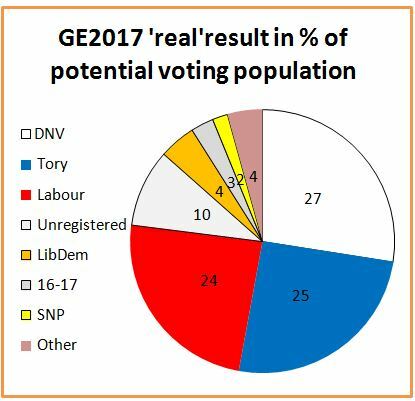 What appears to be clear, though, is that there are strong majorities, especially in more urban and cosmopolitan areas, against the fundamentals of Tory/UKIP agendas – public services austerity, hard Brexit, tax avoidance by the wealthy and the non-doms, and probably remote Westminster-village-dominated governance. There are quite strong majorities for a Tory/UKIP ethos in more rural, suburban/NIMBY and some lagging areas. The challenge for progressives is to organise and mobilise much better than little Englanders. It is not clear that current party structures facilitate this. Probably the best example came from the Greens, who held off in some seats, focused on others, and who had a coherent, progressive manifesto and an impressive, articulate Leader. That, at the end of the day, the Greens with a credible campaign won a total of 525,000 votes – whilst the totally shambolic UKIP retained 594,000 is a rather depressing and graphic illustration of the overall state of progressive politics in the UK. A third issue cast an awful shadow over GE2017 – the terrorist outrages in Manchester and London. May should bear some responsibility for the post-2010 decimation of community policing, and for anti-terrorism and anti-extremism policies and programmes – and it is to be hoped that her purported new found humility extends to this. Beyond the outrage and sadness, though, what struck me most was a Greater Manchester police statement that “Sadly we’ve seen an increase in hate incidents since the bomb from 28 on Monday (22nd May), which is our normal average a day, through to 56 on Wednesday” [my emphasis]. That a city as progressive and welcoming as Manchester can have a ‘normal’ level of hate crime incidents of 28 per day is absolutely horrific. What sort of country have we become if this is ‘normal’? Perhaps the major concern of the collapse of national democratic legitimacy, and the failure of a progressive majority to exploit this, concerns the imminent start of Brexit negotiations. 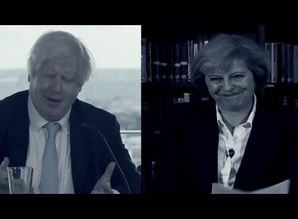 As we approach the anniversary of the victory of the little Englander xenophobes and their political/ financial opportunist ringleaders, we have absolutely no certainty as to what the two major parties at Westminster really think should be sought in the Brexit negotiations. Both Tories and Labour seem to be full of contradictions about tactics, and fantasies about outcomes. There has been some interpretation of GE2017 as a mandate for a ‘softer’ Brexit, and considerable musings about ‘parking’ UK Brexit in a Norway or Switzerland-esque shell for an indeterminate period post-2019. That, though is not the language of May, nor of the UKIP wing of her party. Starmer and McDonnell suggest two different approaches going forward for Labour. Whether any of this is acceptable to EU27, and whether GE2017 actually gave a mandate for it, is anyone’s guess. If ever there was a need for a new progressive narrative about this sorry state, now is the moment. How about…”The 2016 referendum was ill-judged, principally a Tory party device to lance UKIP. It had to be advisory. It was conducted dishonestly. Its results showed a deeply divided country, with a small but indecisive majority for ‘leave’. The May Government has tried to interpret and deliver that result in a particularly extreme form. They have had almost a year, and we are no more certain now they can deliver their intentions than we were in July 2016 when May formed her first Government. She has sought an electoral mandate for her approach and this has been clearly rejected. Yet she has continued to populate her external-facing offices of state with the failed Brexiteers, and even brought their main ‘liar’ back into Government. To attempt to progress Brexit as the major task of Government over 2017-19 represents a genuine existential risk to the UK. It has reignited the Gibraltar question with Spain; it is breaking apart the Northern Ireland Good Friday agreement; and it creates uncertainties over the future position of Scotland in the UK. Moreover, it severely threatens London’s position as Europe’s premier world city, the UK’s main driver of growth, and Government’s major generator of revenue. Most importantly, a focus on Brexit negotiations prevents the UK addressing the issues and priorities raised in repeated elections and referenda in recent years, and the economic and societal challenges that underpins them. It is hard to envisage this happening…but it probably does represent a consensus across a broad spectrum of UK politics, and is unlikely to be an anathema outside fairly modest-size little-Englander UKIP communities. And we do live in extraordinary times! Many have sought to take something positive from GE2017, and I hope this optimism is well-founded. At the moment, though, May is clinging on and Corbyn/McDonnell are calling for more of what they do best – movement politics and campaigning. A broadly-based progressive alliance might be able to address the zero-sum politics of an over-powerful Westminster through radical devolution and innovative electoral reform. They could try to craft consensus for the sort of societal challenges that have brought ‘hate crimes’ and intolerance to the cities and communities of our country, and austerity to our public services. But isolating and freezing the Brexit virus is surely a prerequisite for kick-starting any healing process? As of GE2017, UK remains a divided, deeply-flawed, failing country. There is a window of opportunity to begin the turnaround. Is there anyone bold, decisive and honest enough to open that window?